Probably the first scripture trinitarians point to in an effort to support their triune God dogma is John 1:1. Actually, there is nothing at all about a triune God presented in that verse, so whatever is thought concerning a triune God has be imagined beyond what is written, then added to, and read into what is stated. Paul lets us know that there is only one who is the source of all, and thus that there is only one who is "God" (with a capital "G" -- the Supreme Being -- 1 Corinthians 8:6). Peter lets us know that it is the one Supreme Being who made Jesus to be both Lord and Christ (anointed one). The prophetic words of Messiah in Isaiah 61:1 lets us know that it is Jehovah who anointed and sent Jesus. Jesus lets us know that Jehovah who sent him is his God and Father, the only true God (Supreme Being). In effect, Jesus denies that he is God -- the Supreme Being -- by his words in John 17:1,3. John 1:1 is only scripture that I can definitely agree that the Greek or Hebrew word for "god/God" in the Bible is applied to Jesus. There may be a very few other scriptures, but all others I cannot be sure of. At any rate, it should be apparent that in John 1:1, or any other scripture where "God/god" is thought to apply to Jesus, it is not being used in the sense of the Supreme Being, but rather in the sense of might, strength, power (the basic Hebrew meaning of the Hebrew word for "God/god". In effect, the Biblical Hebraic usage of the word for "God/god" do not exactly match the English usage of "God/god". The King James Version (KJV) shows Biblical Heraic usage for the word "god" by rendering the Hebrew word for "God/god" in different ways: The Hebrew word for God/god is rendered as "mighty" in the following verses: Genesis 23:6; Exodus 9:28; Psalms 50:1; 82:1; 89:6; Ezekiel 31:11. The KJV renders the Hebrew word God/god as "power" in the following verses: Genesis 31:29; Proverbs 3:27; Micah 2:1. The KJV renders the Hebrew word for God/god as "might" in Deuteronomy 28:32. The KJV renders it as "strong" in Ezekiel 32:21. This is only a sampling of the Hebraic usage as shown in the Bible; nevertheless, it demonstrates that the Hebrew meaning for God/god can be used of men, without meaning that they are the Supreme Being or that they are false gods. As meaning the Supreme Being, it only applies to the God and Father of Jesus, since only the God of Jesus is the source of all might. (1 Corinthians 8:6) Therefore, what is presented above shows that the Hebrew word for God/god does not exactly correspond to the English usage of the word God/god, else the KJV could have rendered Genesis 31:29 as "It is in the god of my hand." As it is, however, English, and most other Romantic languages, do not make use of the word "god" in this manner. Consequently, due the common modern concept of God/god, whenever it is applied to others than the Supreme Being or of false gods, it would be best to render it as the KJV as presented earlier (and all other translations I have examined in many of the scriptures) with some form of might, power, etc. Jesus words recorded in John 10:34-36 shows that the meaning is being brought over into the Greek word often transliterated as THEOS, for Jesus was not saying the sons of the Most High are the Supreme Being, nor was he saying that they are false gods. Applying the Hebraic usage in John 1:1 would give us the English, "the Word was mighty", not the Word was God (as meaning, "Supreme Being"). This would correspond with the way the King James Version the Hebrew word for "God/god" in Psalm 82:1 ("mighty").The ONLY reason for not doing so with THEOS as applied to the Logos in John 1:1 is due to man's preconceived notion that Jesus is the Suprenme Being, and the further assumption that Jesus is one of three persons of the Supreme Being. 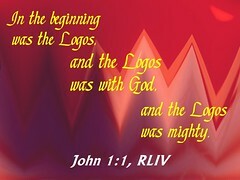 This being so, any usage of John 1:1 as an alleged proof of a triune God (which concept is no where ever once presented in the entire Bible) is circular, that is, because we believe that Jesus is the Supreme Being, we believe that THEOS applied to the Logos in John 1:1 means that he is the Supreme Being, thus because of what we believe, John 1:1 is proof that Jesus is the Supreme Being. Again, 1 Corinthians 8:6 shows that there is only one person who is the source of all, which certainly includes the source of all might, power, strength.